producing very impressive releases, often under the radar of many consumers. On a gorgeous March day, I had an opportunity to follow-up with two local winemakers, both creating stunning wines, one making history. Deep into the valley, miles up Foxen Canyon Road, I come upon a small, discreet sign and electronic gate, the entrance to the entrance of Demetria Winery. Inside the first gate, holding the code to the second, I began the 3.5-mile trek on a long and winding hilltop road surrounded by steep vineyards and incredible vistas. 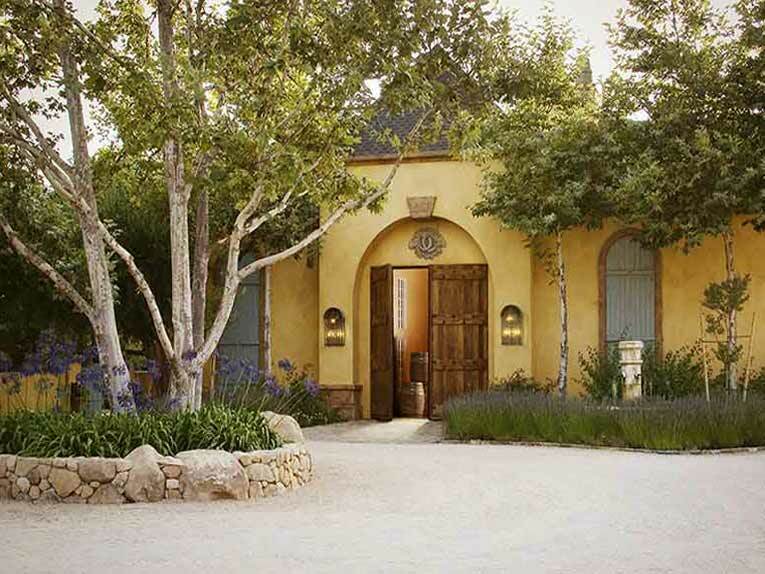 Past the second gate, up the road another quarter-mile, we pass the beautiful home of John Zahoudanis, founder/owner and another few hundred yards, we find a classic country French estate winery/tasting room. My arrival at Demetria, greeted by Alexei Zahoudanis, looking like the young “world’s most interesting man”, was full of anticipation of tasting good wines, including the 2009 Demetria “Eighteen” Chardonnay Reserve, Santa Rita Hills ($45), having tasted the previous vintage last year. Grown in the westerly Santa Rita Hills appellation, known to produce diverse, micro-climate specific chardonnay, both vintages of the “Eighteen” expressed nice stone fruit, pineapple and floral notes on the nose, emphasizing rich pear and peach flavors that yield some acidity on the finish. Adding 100% malolactic fermentation and negligible non-native yeast, this bone-dry wine is definitely one to bookmark. Known for the production of both Burgundian and Rhone-style wines, Alexei suggested a comparison of the 2009 and 2010 Demetria “Cuvee Papou” ($28). “Papou”, meaning grandpa in Greek, is a Rhone white blend tribute to John’s grandfather that, through various vintages, includes such varietals as marsanne, roussane and grenache blanc grapes. The distinction in the 2010 vintage is the addition of 35% roussane to the traditional marsanne-grenache blanc blend. The result is a full feel in the mouth and more expressive orchard fruit flavors, a wine that will pair well with food or just sipping on a nice summer evening. Speaking of good food wine, the 2009 Demetria Pinot Noir Santa Maria Valley expresses an earthy bouquet with nice acidity and spice in the flavors, a nice addition to a marinated pork roast. Likewise, the 2009 Demetria Tempranillo ($55), from some of the oldest vines in the valley and spending 24 months in oak, has the deep, layered flavors that will stand up to spicy meats. 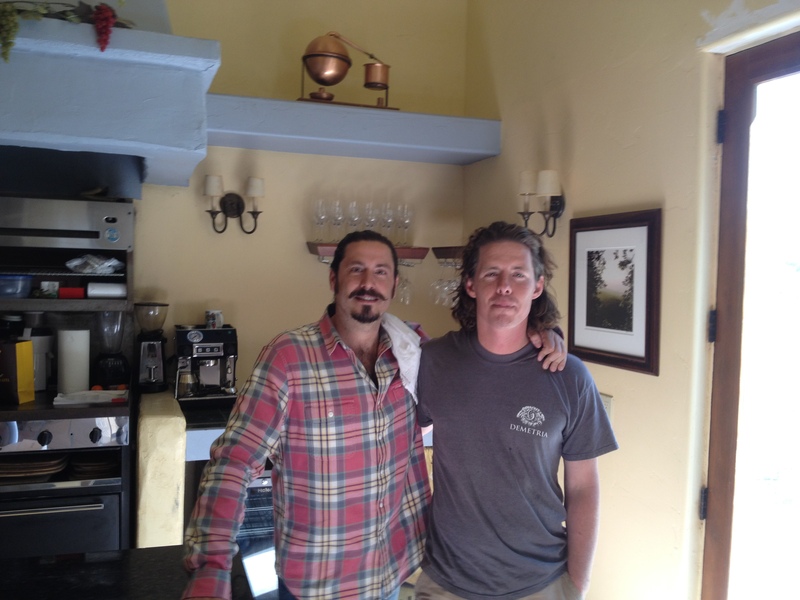 Soon, a gentleman looking very much like a Santa Barbara surfer dude, with a pleasing Australian accent, joined us. Harry Waye, the winemaker at Demetria, enthusiastically discusses his wines with anyone who will listen. The passion exhibited by both Alexei and Harry actually made the wine taste better. Michael Roth, the original winemaker, is still involved as a consultant. Saving the best wines for last, Alexei opened a bottle of 2009 Demetria “North Slope” Syrah ($37), a flagship release whose 2008 vintage received a 94-point rating from Wine Advocate. The “North Slope” adds 5% viognier that is field-planted with the syrah, both biodynamically farmed. It conveys ripened fruit on the nose and palate with the definitive creamy texture, setting it apart from other wines. The next wine, the Rhone-style grenache-syrah-mourvedre blend 2009 Demetria “Cuvee Constantine,” flaunted very rich and jammy fruit flavors, notably the result of a late season heat spike, causing some grapes to be over ripened. the end product is a nicely textured accessible wine that, according to Alexei, is ready to drink. I am always interested when I see a good California single-varietal grenache, whether from Paso Robles, Calaveras County or points unknown. the flavors are typically upfront with rich texture. To my surprise, we ended the tasting experience with the all-grenache 2009 Demetria Rose’, a very nice summer sipping wine that delivers a vibrant acidity and flavors of strawberry and watermelon. This rose’ could also accompany a light lunch. Although isolated, the Demetria Estate Winery provides aesthetics, great wine and a unique tasting experience, equal to any in the region. Call ahead before your next visit to the area and give yourselves some time to get up and down the ridge. 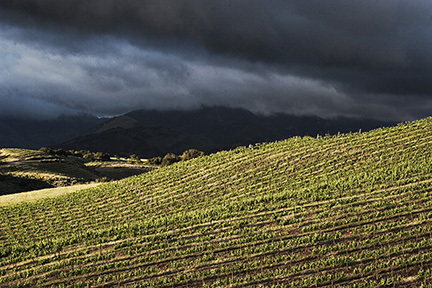 Outside of Solvang, up Ballard Canyon Road, one will find Rusack Vineyards, a small boutique winery that has produced low-yield, handcrafted wines since 1995, mostly under the direction of the husband-wife winemaking team of John and Helen Falcone. I went to taste the inaugural vintages from their new vineyards on Santa Catalina Island, but took some time to enjoy the 2009 Rusack Reserve Pinot Noir Santa Rita Hills, sourced from the Fiddlestix and Rio VistaVineyards near Santa Rosa Road. I have become familiar with the soft cinnamon on the nose and palate and the nice long finish that appear after ample decanting. I was anxious to taste the 2008 Rusack “Anacapa,” a cabernet franc-based Bordeaux blend, to preview the bottle in my cellar. Remarkable balance and soft flavors await, but both wines will continue to mature with some time in the bottle. As reported before, Geoff and Alison Wrigley Rusack over the past few years have been engaged in a serious project to establish vineyards on and produce exclusive wines from Santa Catalina Island. Alison is the great grand-daughter of William Wrigley Jr. who purchased the Santa Catalina Island Co. in 1919 and the family still owns most of the developable land. 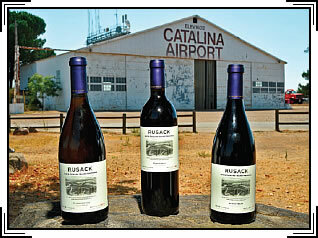 The Rusacks in 2007 made use of the old El Rancho Escondido site along the southwestern coastline to plant 4.5 acres of vines: 2.5 in chardonnay, 1.5 in pinot noir and a special half-acre of ancient zinfandel, mined from Santa Cruz Island, part of the Channel Islands. The vines, remnants from a rustic mission vineyard, were removed and sent to UC Davis for identification. The lab determined the grapes to be from the zinfandel varietal and, replanted on Catalina, they exclusively make up the 60 cases of the first-harvest 2009 Rusack Santa Catalina Island Vineyards Zinfandel. Although young and not a big fruit bomb, the wine expressed a nice spice to the flavors with hints of vanilla at the finish. A nice crispness with some oak influences aptly describes the 2009 Rusack Santa Catalina Island Vineyards Chardonnay (250 cases), partially the result of 50% malolactic fermentation that impacts the full tropical bouquet and complex flavors. The pinot noir grapes, some the last to be transported off the island, seem to have “weathered the storm” quite well. Following a wonderful, traditional pinot bouquet of spice and black cherry, the 2009 Rusack Santa Catalina Island Vineyard Pinot Noir (125 cases) rewards the palate with cinnamon, vanilla and black cherry through an extended finish. One can only guess the future of the island label. The Rusack team, with a history of success, has done extensive research and, barring a consistently unpredictable climate, has the skill to make it happen. However, there will always be a first vintage. My other reason to stop by was to pick up a bottle of each varietal, properly packed in a “first harvest” wooden box and quickly transported to my cellar for some maturity. I know that luck is the result of hard work. This entry was posted on Monday, June 11th, 2012 at 1:02 am	and posted in Wine. You can follow any responses to this entry through the RSS 2.0 feed.